Transfer pricing (the pricing of cross-border intra-firm transactions between related parties) is now the top international tax issue faced by multinational enterprises. In an international taxation environment characterized by rigorous enforcement of transfer pricing documentation, disclosure, and audit processes, a need has arisen for multinationals to be cognizant of the impact of their ‘tax risk appetite’ on their relationship with taxation authorities and to be aware of how best to manage their transfer pricing arrangements. The most promising development has been the growing commitment to Advance Pricing Agreements (APAs) – arrangements made prospectively between a multinational taxpayer and one or more revenue authorities, agreeing on an appropriate set of criteria for the determination of the transfer pricing of the covered transactions over a period of time. This is the first book to offer expert insights on APAs from a practical perspective. By focusing on the United States and Australia, the two countries that were at the forefront of adopting APAs and whose wealth of experience over two decades confirms their APA programs as the global paradigms, the author is able to highlight the advantages and disadvantages of pursuing an APA and to shed light on the powerful efficacy of this strategy for avoiding transfer pricing disputes. In addition, the author enlists the views of revenue authorities, transfer pricing practitioners, and corporate counsel who deal with the realities of transfer pricing assessment and compliance on an ongoing basis, offering acute insight into how APAs really work in a practical way. 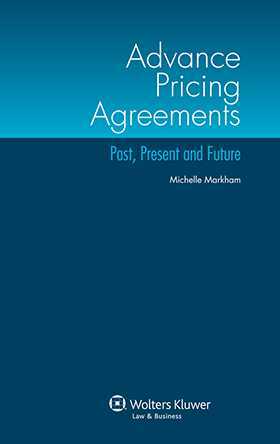 This book contributes to the body of knowledge on APAs in the context of transfer pricing by providing in-depth scrutiny of the most important issues surrounding this critical area, and by examining innovations in APAs in the United States and in Australia. Its unmatched coverage will be welcomed by tax experts at law firms and multinational companies as well as by revenue officials, policymakers, and scholars and researchers in international taxation. Chapter 2. Advance Pricing Agreements in the United States. Chapter 3. Advance Pricing Agreements in Australia. Chapter 4. The Future of APAs.